The lovely Kaitlin, (you may remember her from our trip to the Chicago Cubs game,) introduced me to the Perfect Foods Bar. These gluten free bars are simply divine. I was beside myself with joy when the company agreed to work together on a review and giveaway. I received boxes of each of their flavors and their snack sizes and all thoughts and opinions are my own. 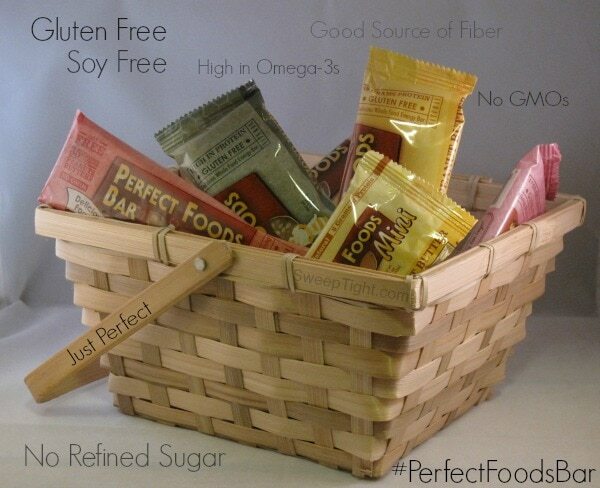 Here’s a little information about the bars, but for all the details and to purchase them (you are really going to want to) please visit the Perfect Foods Bar website. So keep them in the fridge! If you like peanut butter (who doesn’t) or almond butter then you’re sure to fall in love with these meal replacement bars. They start with the simple deliciousness of peanut butter and add in other super healthy ingredients. I have been eating these daily for the last couple weeks and had no idea they contain things like tomato, bell pepper, alfalfa and celery. No wonder I feel so fantastic! 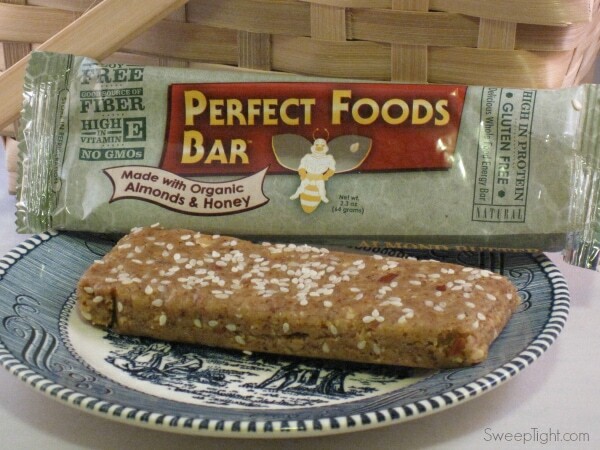 Perfect Foods Bars save me time and money. I grab them everyday to eat while I’m at school. This way, I’m not spending money on lunches out and don’t have to spend any time preparing food to go. I love them with tea… So far my favorite combo is a pumpkin spice tea with the fruit and nut bar. It’s a total party in your mouth. Since I am in school for nutrition, all my classmates are always curious so I brought some in for them… not a disappointed taste bud yet! These are meant to be meal replacements as the calories per bar are around 300 and the Cranberry Crunch Lite has 200 calories. However, the snack size is only 100 calories and perfect for kids’ lunches or just a little treat. I like using these as exercise rewards too. 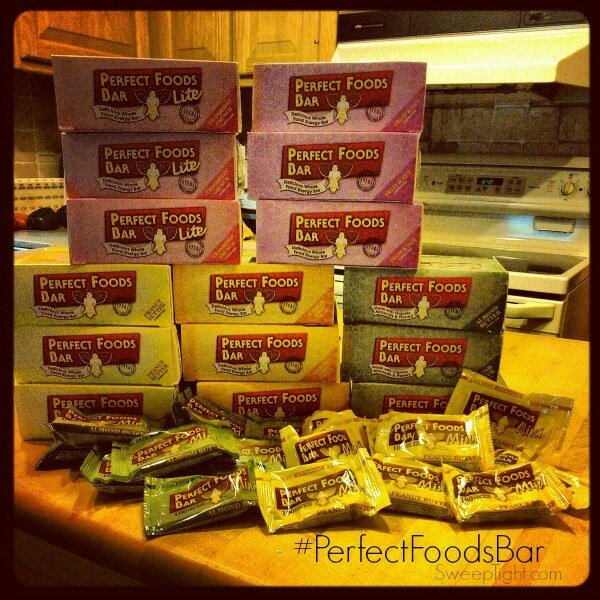 The Perfect Foods Bar needs to be refrigerated because it doesn’t contain any preservatives. But I like to eat them closer to room temperature so I throw them in my bag in the morning at eat them around lunch. The #PerfectFoodsBar is now a staple in my house. 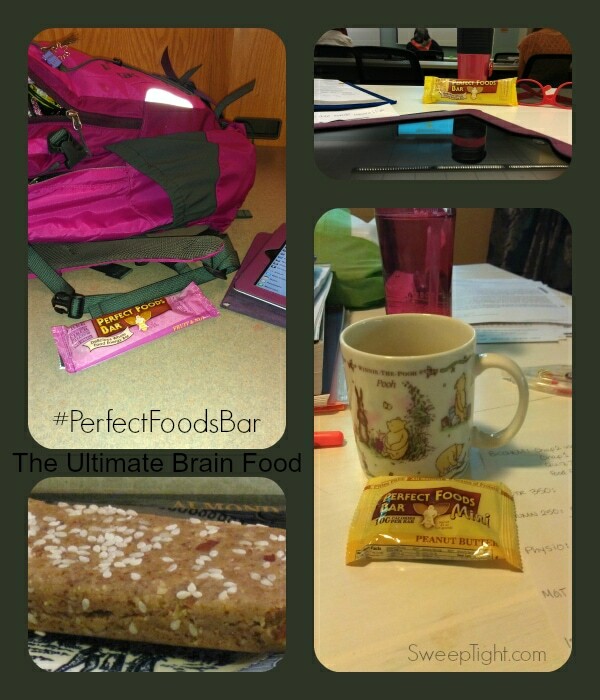 For more on Perfect Foods Bar, find them on Facebook and Twitter. I love that their bars are gluten free! Thanks for sharing your review. This bar is definitely one that I’ll have to add to my database of gluten free protein bars.